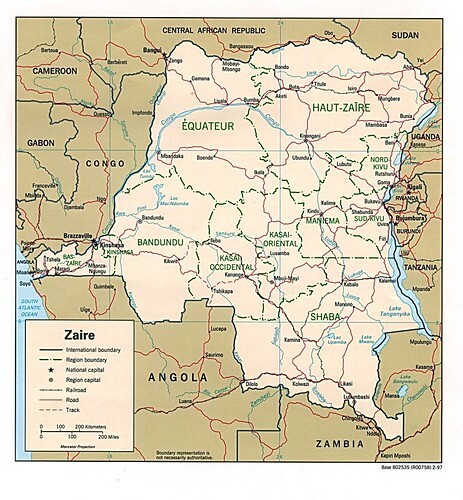 The Democratic Republic of the Congo is renamed Zaire. The Republic of Zaire was the name for the Democratic Republic of the Congo that existed between 1971 and 1997 in Central Africa. The country was a one-party dictatorship, run by Mobutu Sese Seko and his ruling Popular Movement of the Revolution party. Zaire was established following Mobutu’s seizure of power in a military coup in 1965, following five years of political upheaval following independence known as the Congo Crisis. Zaire had a strongly centralist constitution and foreign assets were nationalised. The period is sometimes referred to as the Second Congolese Republic. A wider campaign of Authenticité, ridding the country of the influences from the colonial era of the Belgian Congo, was also launched under Mobutu’s direction. Weakened by the end of American support after the end of the Cold War, Mobutu was forced to declare a new republic in 1990 to cope with demands for change. By the time of its downfall, Mobutu’s rule was characterised by widespread cronyism, corruption and economic mismanagement. Zaire collapsed in the 1990s, amid the destabilisation of the eastern parts of the state in the aftermath of the Rwandan Genocide and growing ethnic violence. In 1996, Laurent-Désiré Kabila, the head of the Alliance of Democratic Forces for the Liberation of Congo (AFDL) militia, led a popular rebellion against Mobutu. With rebel forces successfully making gains beyond the east, Mobutu fled the country, leaving Kabila’s forces in charge as the country restored its name to the Democratic Republic of the Congo the following year. Mobutu died within four months after he fled into exile in Morocco. Ronald Reagan stops construction of the new US Embassy in Moscow after Soviet listening devices are found in the building structure. United States President Ronald Reagan has decided to tear down its new Moscow embassy building, which is heavily penetrated by Soviet listening devices and build a replacement. The Administration has been trying to decide what to do about the building since the existence of the listening devices was disclosed last year. Government intelligence experts would be reluctant to certify that the American embassy structures are protected against Soviet spying unless an entirely new structure is built. Because Congress has adjourned, Mr. Reagan’s decision to consult lawmakers apparently postpones final action on demolishing the building to his successor and the 101st Congress, which will be asked to provide the money, possibly hundreds of millions of dollars, for the job. Construction of the chancery was halted in 1985 because of suspicions that the Soviets had planted listening devices. American intelligence specialists have been examining the structure to try to determine how the Soviet spying techniques work. If the chancery is saved, the building would be used for unclassified activities, while the old embassy building next door would be refurbished and used for classified activities. Soviet officials will not be able to occupy a new Soviet Embassy office building until the American chancery is demolished and replaced. Great Britian tests a nuclear bomb at Emu Field, South Australia. Riots start in Paris after the deaths of two Muslim teenagers. Riots starts in Paris after two Muslim teens are killed. Constantine the Great is said to have had his Vision of the Cross.